Skip this step if you already have a running Drupal 8 installation. Download Drupal 8 from drupal.org. 2. Install the H5P module as you usually install a Drupal module. If you are new to Drupal modules, you can take a look at Drupal's installing modules guide. Drupal Content Types should not be confused with H5P Content Types. Drupal Content Types are simply different types of web pages such as articles or blog posts. H5P Content Types refer to the different types of H5P content such as Course Presentation or Memory Game. 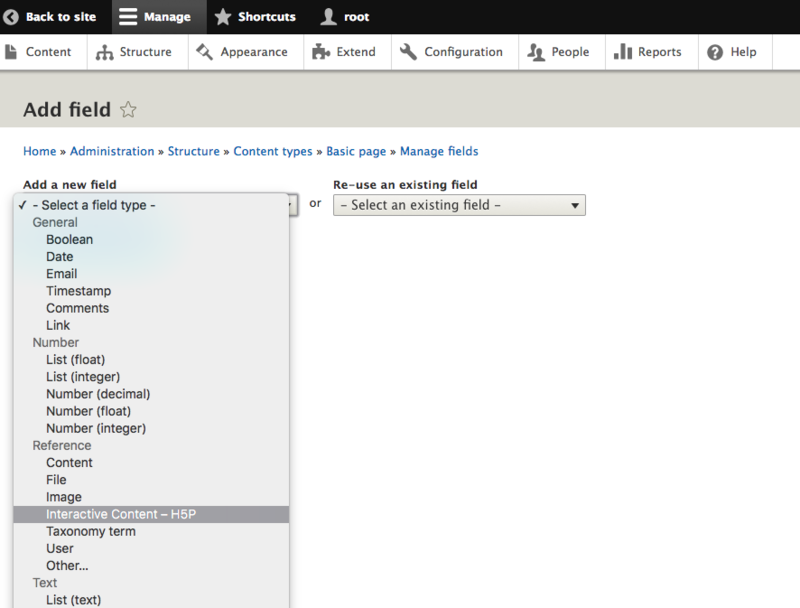 You can add H5P content to Drupal Content Types by adding the H5P field. Let's add the H5P field to 'Basic Page', one of Drupal 8's default content types. You can specify the number of H5P fields you want to have in a content type. Let's choose 1 for now. Now your module is set up, and you can start creating H5P Content. After you click on "Add new" The H5P Hub will load - offering you a variety of content types to pick from. Depending on the framework used, access to H5P features may be controlled by defining the permissions for roles or users. In Drupal, H5P has the following permissions available. They should be assigned users/roles as shown. * The "update h5p libraries" permissions enables the user to upload H5Ps with updated library versions. Whether or not editors should have this access is up to site policy. Updating old content to new versions can change their appearance and functionality significantly, preserving old content through library upgrades is always one of the main focuses of a library developer. Be aware of possible versioning and content upgrades issues when letting users upload altered H5P libraries. ** The "Create restricted H5P content types" permissions enables the user to create content types that users without this permission aren't allowed to create. Admins can configure what content types are restricted at admin/content/h5p. Who should have this access is up to the site policy. H5P shortcodes are not yet possible in D8. By enabling Drupal's Views module a view will appear as a tab on each H5P node and on each user profile displaying basic result information. Drupal 8's Views module allows us to display content from our database in a variety of ways. In our case, we are going to show two different displays, one for the results of each user and another for the results of each node. To upload a pre-built view, click on the 'Configuration' tab then 'Configuration and synchronization'. Click on the 'Import' tab and select 'Single Item'. The full path is '/admin/config/development/configuration/single/import'. Note this sample view expects the H5P Field you created to be called 'H5P' as this will result in the machine name 'field_h5p' which is the machine name the view is seeking to match. Press 'Edit' to see how the H5P results View is defined. The sample View comes with two displays, one for User Results and another for Node results. For the purposes of this tutorial, we are just going to show the User results display. If you open the view in edit mode, do you see "Broken/missing handler" several places? I am seeing the Broken/missing handler in the view "Relationships". What must I do? I created a separate thread for you here. Which image are you pertaining to? I tried to install H5P on Drupal 8 using Composer and it did not work. I used package "h5p/h5p-core" and "h5p/h5p-editor", installation was successfull but the module did not appear on drupal extensions page. It works with standard installation (like described above). I'm sorry I do not have any experience with Composer but somebody from the community may have successfully done this and I hope that we can get input from them. Thanks for your reply : i hope someone will help me ! I have a need to allow users to take a quiz multiple times, and I need to track results for each attempt. After using the H5P module, I was successfully able to use the system. It appears that each time a user takes a quiz, it overwrites the existing results for that quiz. Is there a way to track all attempts for each user for quizzes? It would be great if all results were stored instead of only the most recent. Currently this is not possible with the features of H5P. Although this should be possible by adjusting some settings/codes of some LRS, I'm not sure though how to do it. And if someone in the community has implemented something similar feel free to join the discussion. Trying to style H5P on Drupal 8! I don't see anything working with the Module trick, I'm wondering if it was for D7..? Please note that creating custom modules for Drupal 8 can be found here. Thanks but as you may imagine, I tried it, and I'm not at my first project on Drupal 8. So I don't understand why, but it is not working... Are you sure it works with drupal 8.6 ? Did I miss a part? I need just to make a new module, I install it, in my mymodule.module file I add the code as shown in the Visual Changes page and then I'm supposed to see my css file on the page... Right? Did you use the correct module name and remember to clear the cache? I found another way around, but i'll see if I can try again. Did a fresh install for a new site and some of the quiz are missing now. Mutiple choice quizzes and all those that used to be able to fit inside the multiple choice is now missing. Do you mean that they are not on the list of contents to pick from? If so try downloading the sample contents here. Recently tried to move my H5P files from a drupal 7 to a drupal 8 website. Most things work as expected, the integration of H5P contents within a "Basic page" content is better than it was in Drupal 7. 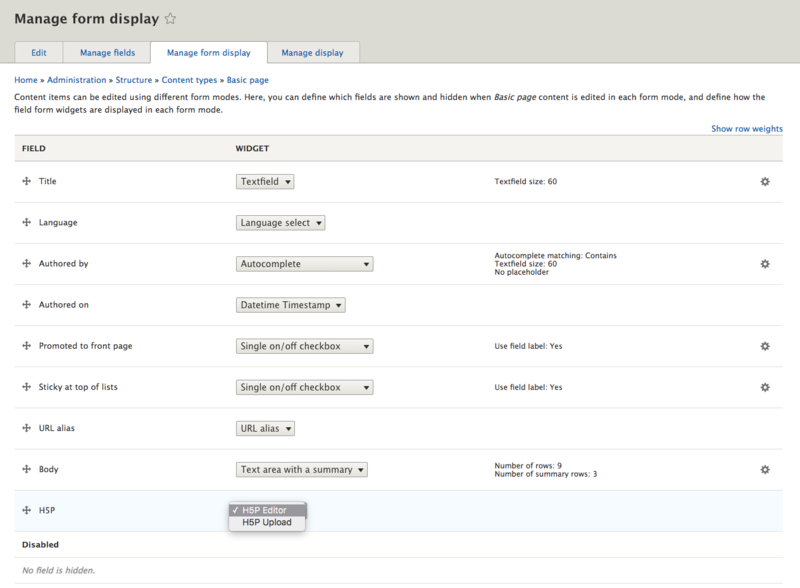 However, the new interface is missing some very useful features of Drupal 7 as displayed on the attached screenshots. 2.- View library details is missing. That's a very useful feature. Why has it gone? 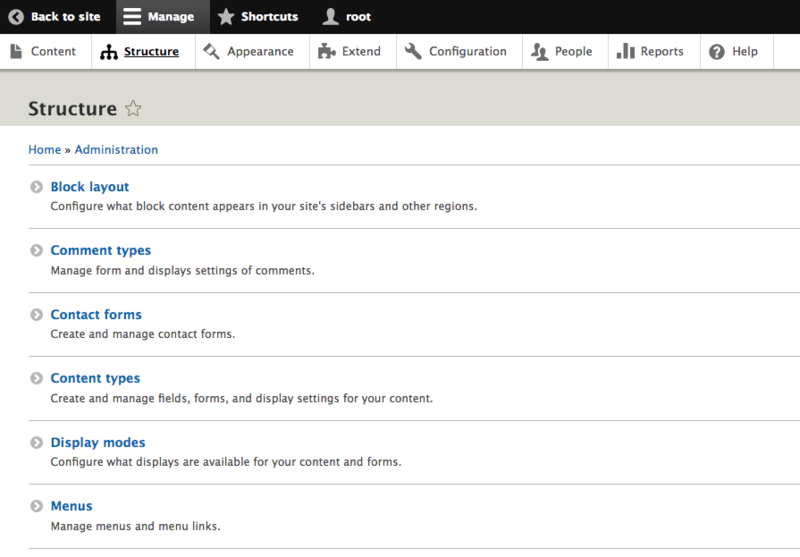 "You can add H5P content to Drupal Content Types by adding the H5P field. 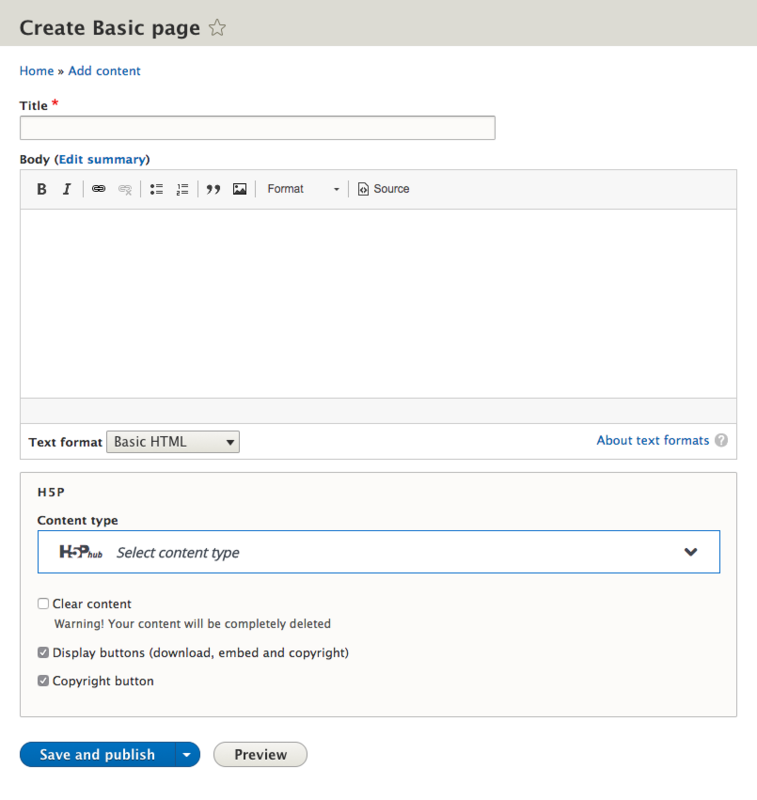 Let's add the H5P field to 'Basic Page', one of Drupal 8's default content types." I don't think this is a good idea. On a Drupal site, the user may want to add a number of "Basic Page" instances without a H5P content/field. I suggest it's better to create a new Drupal content type as explained below. Enter (for example): Name "Page with H5P content(s)"
Description: "A page which contains a body of text and one (or more) H5P content types." Then follow the current description of steps from n° 3: click '+ Add field'. Note. The doc says "You can specify the number of H5P fields you want to have in a content type. Let's choose 1 for now." No, once a the number of H5P fields has been entered you cannot modify it later on. If you try you get the error/warning message "There is data for this field in the database. The field settings can no longer be changed." I recommend setting the number of h5p fields to "Unlimited". Thank you for the suggestions and corrections. I created a task for review and you can follow the progress here. Using a Basic Drupal page with a H5P content/field in it (parametred for an unlimited number of such fields), as explained in my previous post. When creating a page, the body gets displayed, and one H5P field. And we have the 'Add another item' button available. That's OK. However, when Editing such a page, an extra H5P field is automatically displayed. That seems un-necessary, as we may just want to edit an existing field, and the 'Add another item' button would be enough. When editing a Drupal 8 page containing more than one H5P field, the screen is cluttered. It would be nice to have a Collapse/Expand button to collapse the H5P field(s) that we are not currently editing. How can i upload h5p files to aws s3 or any other cloud in drupal 8? I'm afraid this not possible yet.